January 2013 - DsixE contributes to a new IBM Redbook:Developing Exceptional Multi-Channel Web Experiences. The publication is being announced at the Lotusphere Connect 2013 conference, and describes how Web Experience Factory with Worklight can be used to quickly develop a web application for delivery to multiple client devices and form factors. January 2013 - We're starting the new year by rolling out a plugin which enables graphing of models in a project. More details can be found on my blog, it is freely available to everyone and instructions can be found on our eclipse update site. 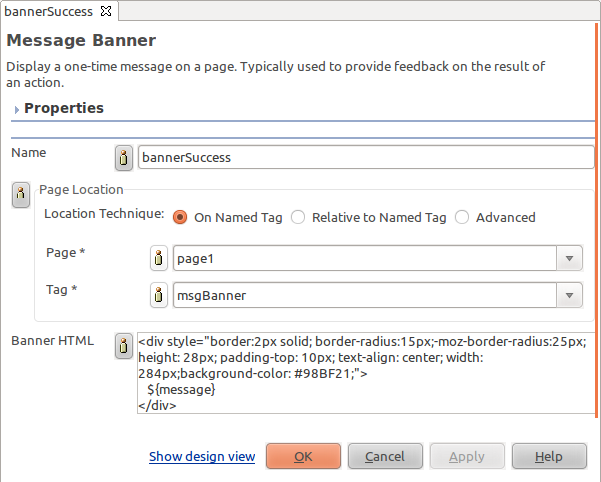 December 2012 - This builder demonstrates how easy it is to capture repeatable design patterns with WEF, the message banner builder is used to provide feedback after an action is executed. The builder not only displays the message, it also automatically removes it on page refresh. Install as a feature in the WEF designer and execute the sample models/solutions/dsixe/MessageBannerTest.model. July 2012 - Our customers have long asked for the ability to send their users email notifications from an application containing a direct link into portal. Using the Direct Portal Link builder, this capability is now possible with WEF. Install as a feature in the WEF designer and execute the sample model in models/solutions/dsixe/DirectLinkDemo.